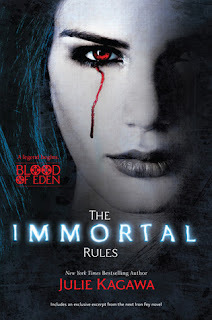 So as you may all know, both us absolutely loved, just loved Julie Kagawa's new book, The Immortal Rules, which is part of The Blood of Eden series. You can check out Patricia's Review HERE and Jaime's Review HERE. The Immortal Rules will be released April 24th and we can hardly wait to get our hands on shiny new books! You can pre-order your copy HERE, you know we have! I can't wait to see it! I'm loving this book.